For courses in HTML and Web Page Design. This comprehensive guide to Cascading Style Sheets shows students how to use the CSS effectively in web page design. The example-rich text offers a practical look at the current status of CSS and provides in-depth coverage of how both the CSS1 and CSS2 standards work in current major browsers. I. 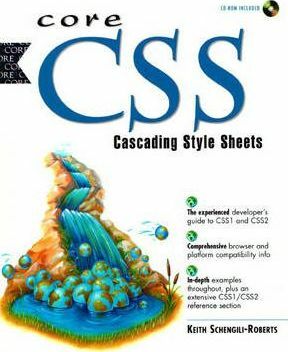 THE ORIGINS OF CASCADING STYLE SHEETS. 1. The Beginning of HTML and the "Browser Wars." 2. HTML and its Relationship to CSS. 3. Browser Adoption of CSS. 5. Implementation of Basic CSS Concepts. 10. The Color and Background Family of Properties. 11. The Text Family of Properties. 12. The Box Family of Properties. 13. The Classification Family of Properties. 15. Selectors, Pseudo-Elements, and Pseudo-Classes. 17. The Box Family of Properties. 18. Visual Formatting Family of Properties. 19. Detailed Visual Formatting Family of Properties. 21. General Content, Automatic Numbering and Lists. 22. Paged Media Family of Properties. 27. Aural Style Sheet Properties. A. CSS1 Property, Pseudo-Element, Pseudo-Class, and Concepts Reference. B. CSS2 Property, Pseudo-Element and Pseudo-Class Reference. 3. Colors, Units of Measure, Percentage Units and URLs. KEITH SCHENGILI-ROBERTS is Webmaster for the Toronto, CA software firm KL Group, and a long-time writer for The Computer Paper, Canada's largest computer magazine.